The articles published in Journal of Universal Surgery have been cited 10 times by eminent researchers all around the world. 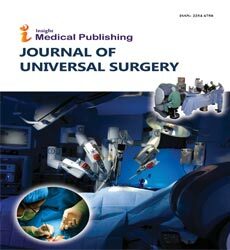 Following is the list of articles that have cited the articles published in Journal of Universal Surgery. Engin O, Sunamak O (2016) Diagnostic laparoscopy in abdominal trauma patients. Annals of Laparoscopic and Endoscopic Surgery 14: 1. Dolganiuc A, Liu X, Sharma A. Dysphagia With Unusual Esophageal Plaques. Gastroenterology 52: e7-e8. Engin O, Sunamak O (2016) Diagnostic laparoscopy in abdominal trauma patients. Annals of Laparoscopic and Endoscopic Surgery. Oct 14;1(1). Engin O, Sunamak O (2016 ) Diagnostic laparoscopy in abdominal trauma patients. Annals of Laparoscopic and Endoscopic Surgery 1. Weale R, Clarke D, Oosthuizen G, Faurie M (2016 )Bullet embolism. Trauma. Srividya B. Drugs Acting on Blood Coagulation system and their Mechanism of Action: A review. Garg B, Singla A, Batra S, Kumar S (2017) Early migration of bone graft causing sigmoid colon perforation after trans-foraminal lumbar interbody fusion. Journal of Clinical Orthopaedics and Trauma. Özveren B (2016) Defining the Pathways of Parental Decision-making and Satisfaction Levels About Newborn Circumcision in a Setting Where Traditional Male Circumcision is Prevalent: An Online Survey Study. Urology. 90:153-8. Vadamalai K (2016) Concomitant presentation of hydatid cyst of kidney and liver-A rare case report. Indian Journal of Case Reports 2: 20-23. GÜLAÇTI HG, PEKASLAN NE, ACAR BÅ. Üniversite ÖÄrencilerinin Sünnet Olma Deneyimlerine Dair Otobiyografik AnÄ±larÄ±nÄ±n Ä°çerik Analizi. DTCF Dergisi 56.